In the 1990s, I had the pleasure of frequenting an Italian restaurant in the community where I lived in Southern California. It was a smallish, but lively place near a golf course, with most of its seating in a walled-in, covered patio that stayed comfortable all year long. It was here that I got hooked on garlic knots…they were the pre-meal bread that was offered upon being seated, and boy, were they good. 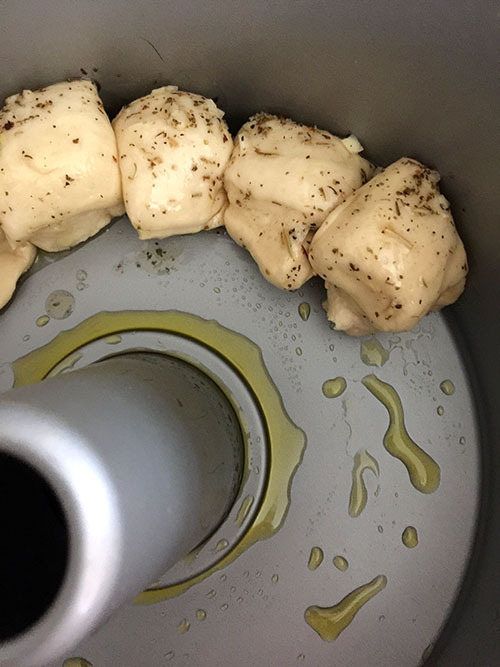 They came heaped on a platter, tight little fists of crusty golden dough, slightly larger than English walnuts, and they were shiny/greasy with olive oil and steeped in garlic. It became the reason for going to this restaurant (that, and the elegant and nice-smelling waiter usually handling most of the orders). With a large Caesar salad (also dressed with lots of garlic and pine nuts), those little bread knots and a tall glass of iced tea, I needed nothing else. The perfect meal. 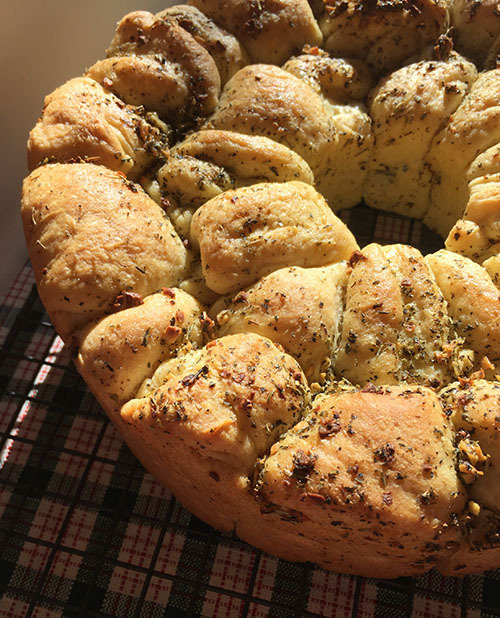 Since I moved to Northern California, I’ve longed for those garlic knots, and though my restaurant jaunts have yielded many yummy breads as that starter for a meal (like the hot popovers served at the Wayfare Tavern in San Francisco), I’ve never found another restaurant garlic knot to speak of. Fast-forward to getting the mail several months ago and seeing the cover of a King Arthur Flour catalog (which always completely distracts me from the rest of the mail). 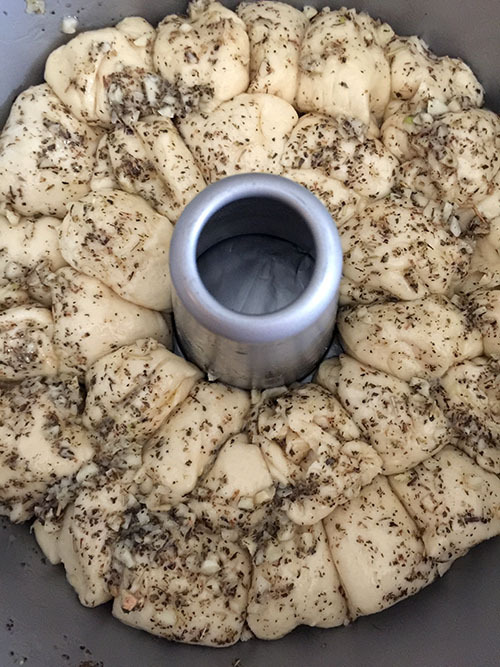 On it, a ring of beautiful bread bubbles, coated in butter, herbs and…garlic! I held onto the magazine as I do many things for baking projects to come. 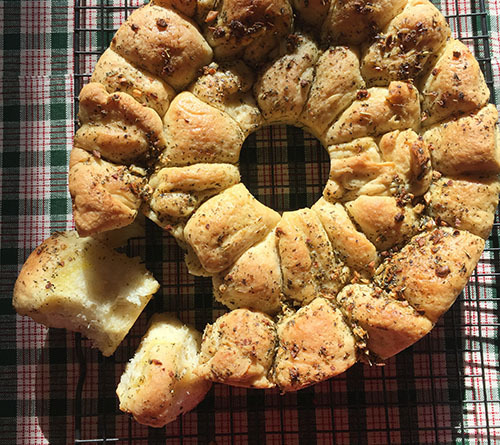 I hoped this golden pull-apart loaf — seemingly perfect for holiday gatherings (which gave me my timeline for making it) — might resemble my long-lost garlic knots. I purchased the “special” (by that, I mean, things that aren’t usually in my pantry) ingredients for this bread a few months before…instant yeast, potato flour or flakes and nonfat dry milk may be in some folks’ regular pantry items, but not always. 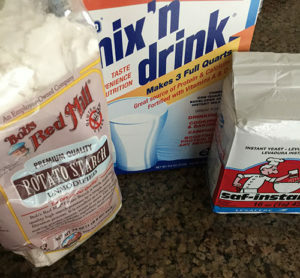 Outside needing these few specialty items, this bread dough is tremendously easy — all the dry and wet ingredients (which include warm water, warm milk and soft butter) go into the bowl at once, and can be stirred together by hand, mixer or bread machine (I went the mixer route). It rapidly comes together to a beautiful soft-but-sturdy smoothness. 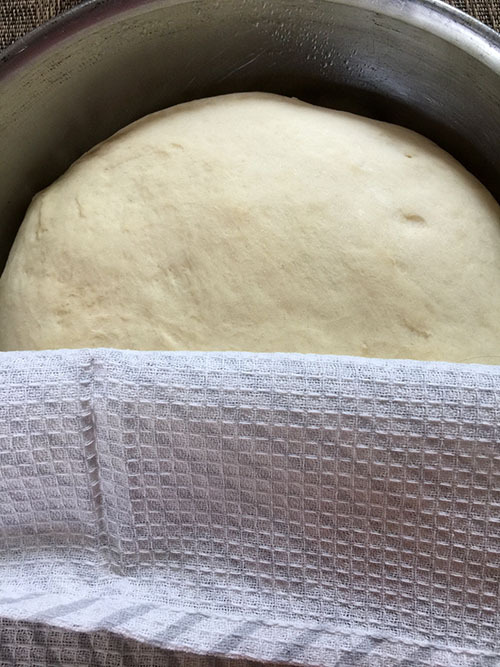 I did give it a few minutes with the dough hook turning to make sure all was combined and kneaded. 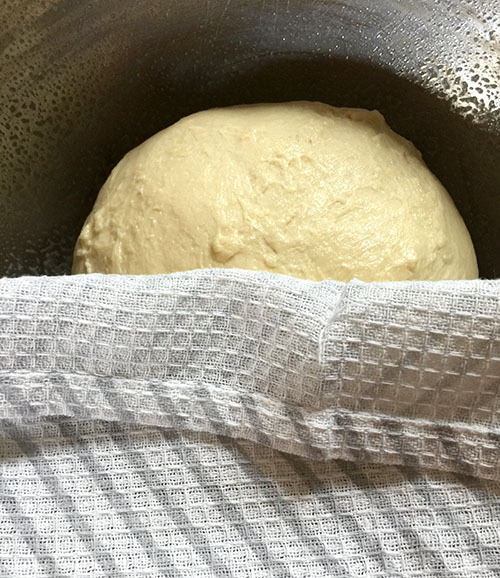 I love to get that smooth ball of dough ready for its “nap” time, which is really an active rising time…into my dark, warmed oven it went, where it bloomed up to double its original size. 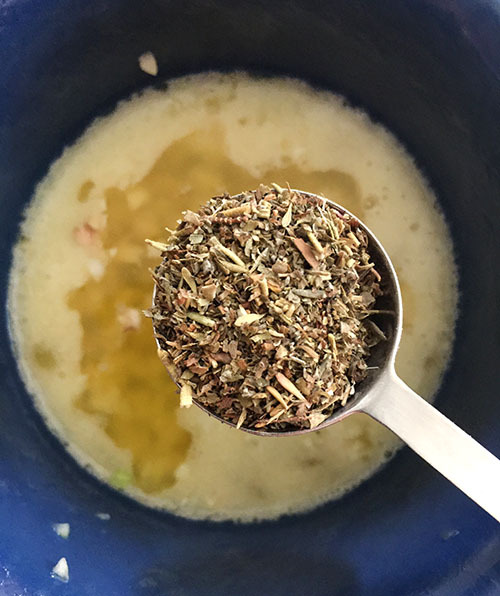 While it was raising, I minced fresh garlic and mixed it in with melted butter and Italian seasoning — the dipping sauce for the bread pieces to come. 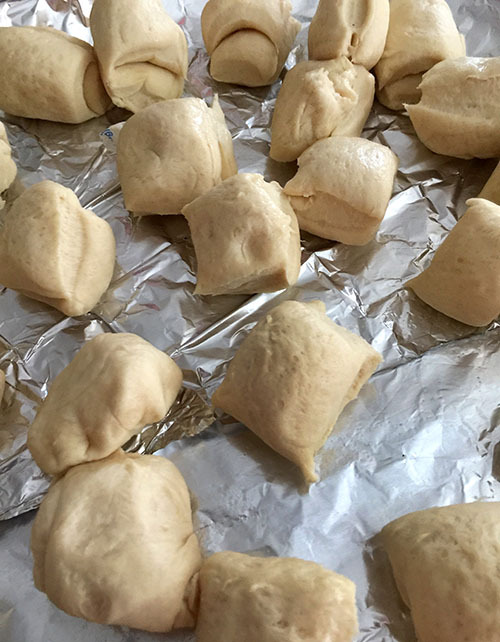 The raised dough was easy to divide into 32 even pieces (thakfully, the instructions say these do not have to be even or made into perfect balls). Mine were more like little squares or rectangles. 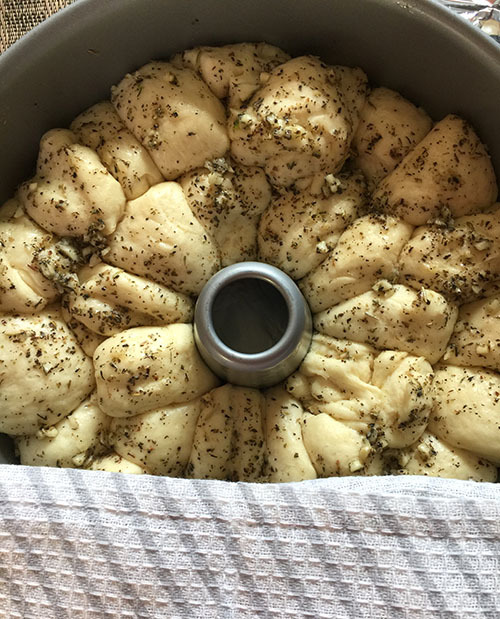 I’ve gotta say, the process of dipping those little dough balls in that garlicky herb butter and arranging them in the tube pan was quite satisfying…I haven’t had such a fun time bread-making in awhile. I let the bubble loaf raise again for another hour, well enjoying the anticipation of the baking to come. 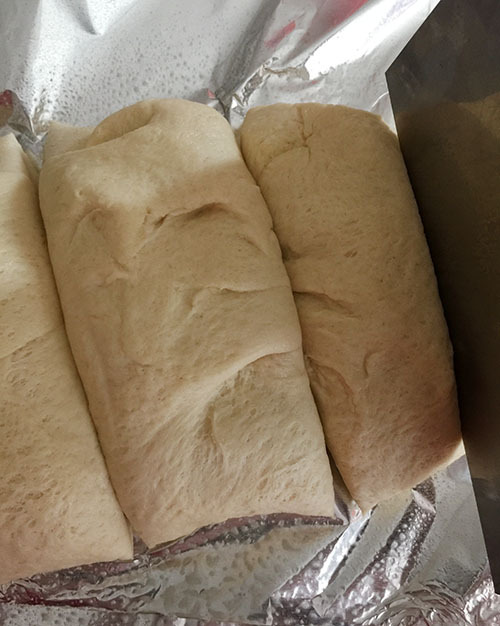 Before baking, I made sure I layered foil underneath the tube pan, which has a removable bottom, so that the olive oil the pan was greased with wouldn’t drip out. The loaf took a little longer than the recipe suggested to get adequately brown — I baked mine about 40 minutes, but was such a beautiful golden when I took it out. And it also removed easily from the pan (I had fears of the hot bread falling apart when I removed the tube from the center). 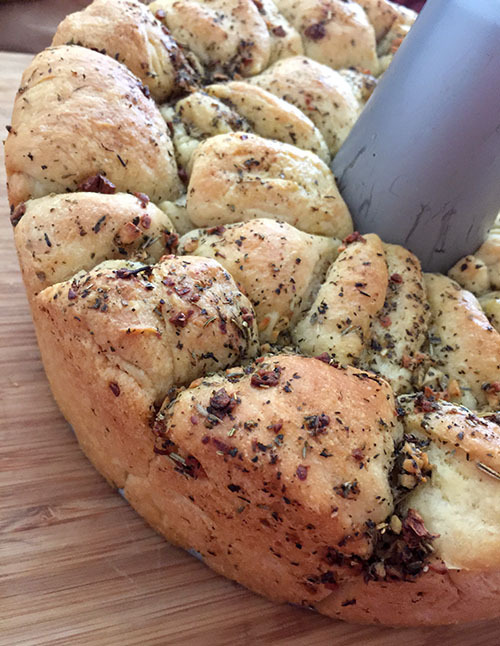 I’m glad there was no waiting to try this…I dug in while the bread was still steaming, and was delighted with the ease of this pull-apart loaf. Its crisp exterior, buttery and laden with garlic and herbs gave way to a tender, moist inside…butter really isn’t even needed. 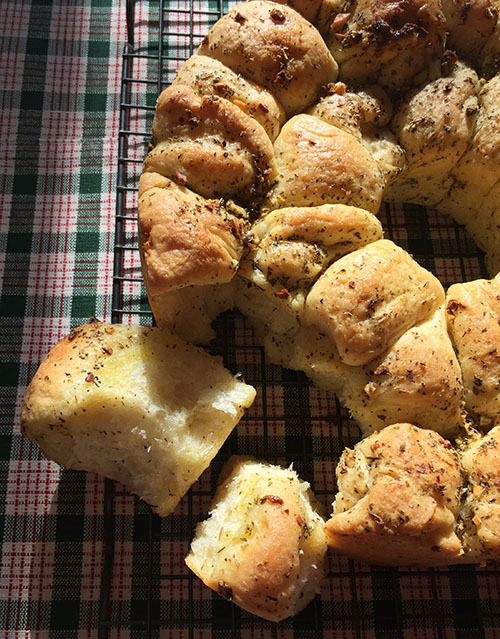 While it was not exactly the garlic knots of my past, it was just as sumptuously satisfying, well worthy of a regular place in my own baking rotation, a welcome, aromatic bread to go with a big pot of beans or a hearty soup. 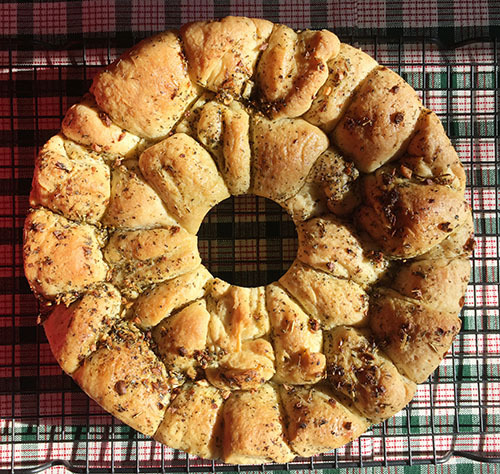 And with its wreath shape, ample servings and ease of serving would be perfect for a holiday table. 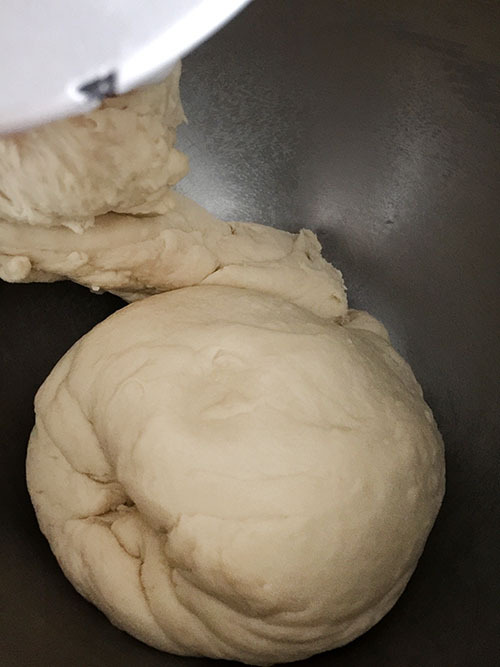 cycle — to make a soft, smooth dough. 90 minutes, until it’s just about doubled in bulk. 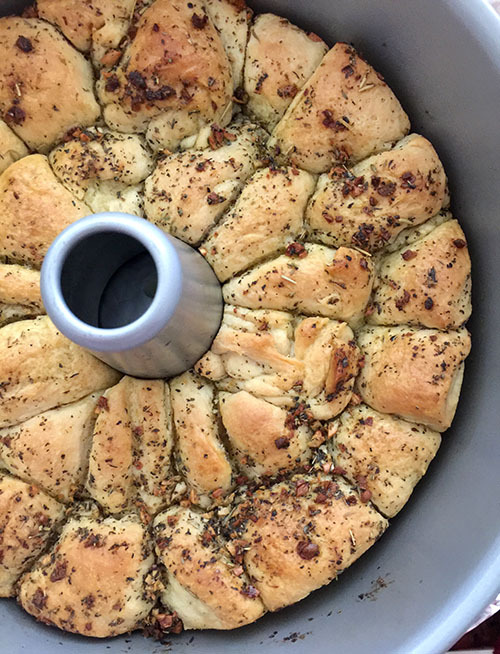 bread pan or tube pan. 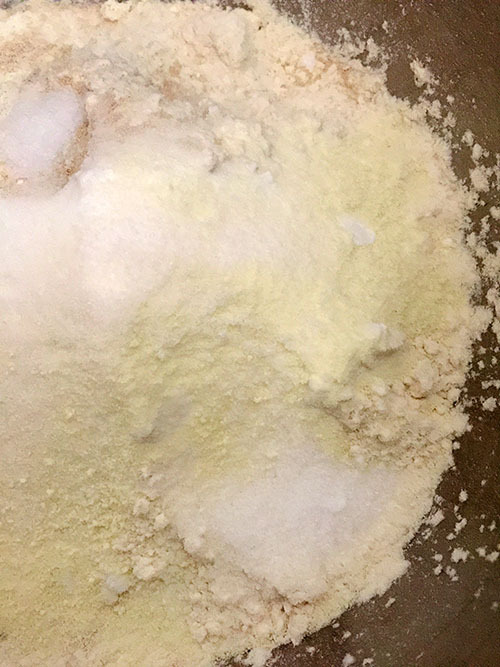 To make the coating: Combine the butter, seasoning, and garlic. 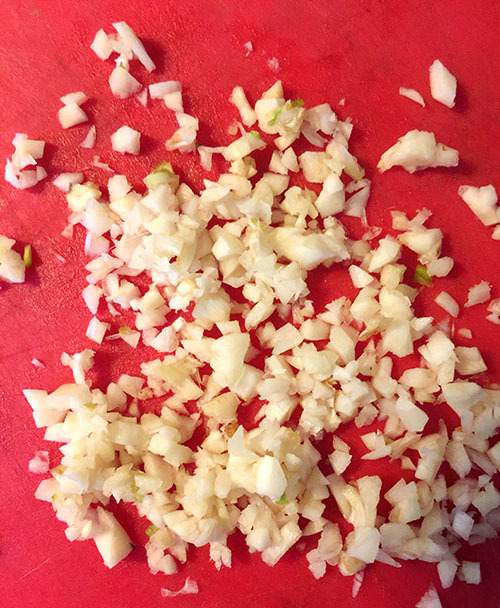 then place in the pan in a single layer; you’ll need to squeeze them in. since I have a slow oven.